Straight from the 2017 Justice League superhero film. This Aquaman ArtFX+ statue stands about 7 3/4-inches tall. Includes magnets in his feet and a window display box. 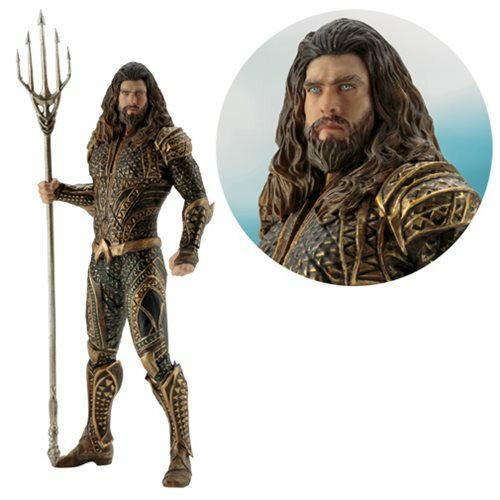 The King of the Seven Seas comes straight from the 2017 Justice League movie. With magnets in his feet for stability on the included base, Aquaman stands about 7 3/4-inches tall in 1:10 scale. Sculpted in precise detail, he replicates the face of Jason Momoa down to the texture and color of his costume and utilities. Arthur Curry comes packaged in a window display box. Display him alone or alongside other ArtFX+ Justice League members (sold separately).